With the weather warming up we have been playing outside a lot. This spring we have been playing a lot out in grandmas playhouse. Maylee has been loving it! When we aren’t playing outside she says “playhouse” meaning lets go play in the playhouse outside. It’s been a blast seeing her play in her playhouse this spring. I’m not sure how the weather was for you this winter but for us it was crazy. We had record snowfall. Basically all of December and January we had snow covering the ground. Since fall we basically never made it out to the playhouse, so this spring we are extra happy to be outside playing in it. This week we cleaned up the playhouse from the winter and added some touches of spring. On the outside we added some potted pansies, hens and chicks, an easter sign, some watering cans, books, and some large metal carrots. We spread little easter eggs around the playhouse for an extra touch of spring. In the bottom level of the playhouse we moved Maylee’s little table and chairs in. We thought this would make a perfect spot for a little spring or Easter picnic playdate. (friends I will be calling you for a playdate soon ). On the table we added some little easter egg shaped plates to eat some snacks on. For the centerpiece we simply stacked some old books and added some vases of faux flowers. We updated the chalkboard to simply say “Spring”. Maylee and the little neighbor girls love to draw on the chalkboard so I am sure it is going to get colored on and changed up very soon. In the upstairs of the playhouse we didn’t add too much. We brought back the pink and tan pillows from last summer. We also added a throw blanket, coloring book, crayons, and books. In the chandelier in the upper level we filled the jars with daffodils and pansies that were around the yard. The chandelier will be a fun thing to have Maylee help change out throughout spring and summer. As more flowers grow I will help her pick them and change the flowers out. As we were decorating and cleaning up the playhouse Maylee was right there with us. Right when we added the pillows and blanket and books to the top she went straight up all on her own and snuggled up to read. She loves to read so it was the cutest thing to see and hear her “reading” one of her books up in the playhouse. She then got busy coloring in her color book. Just this past week she has really started to enjoy coloring and she is surprisingly pretty good at it for a one year old. She is the cutest in her fun playhouse. We are so happy that she is loving her playhouse so much this spring and we are so excited to see her continue to enjoy it through the years. Thank you for stopping by to see Maylee’s playhouse this spring! Hope we inspired you to get your playhouse or play area ready for a fun spring playdate. You can see how we transformed this playhouse in the post here. Check out Maylee’s Fall home tour here. Wow — this is any child’s dream! This is probably the cutest thing I have ever seen! 💙Would you mind if I linked to Maylee’s spring playhouse in a post for this coming weekend? Thank you so much! We would love for you to link to this post! Love this post! So refreshing and fun! Also loved your spring home tour. Beautiful!! Can I buy plans for this playhouse? I am loving this playhouse and it’s giving me motivation as I transform our newly purchased Costco playhouse…. it’s been quite a project! I am wondering if you could send me the info on where you got your wooden swing from or how you made it! I feel like the swing completes it! 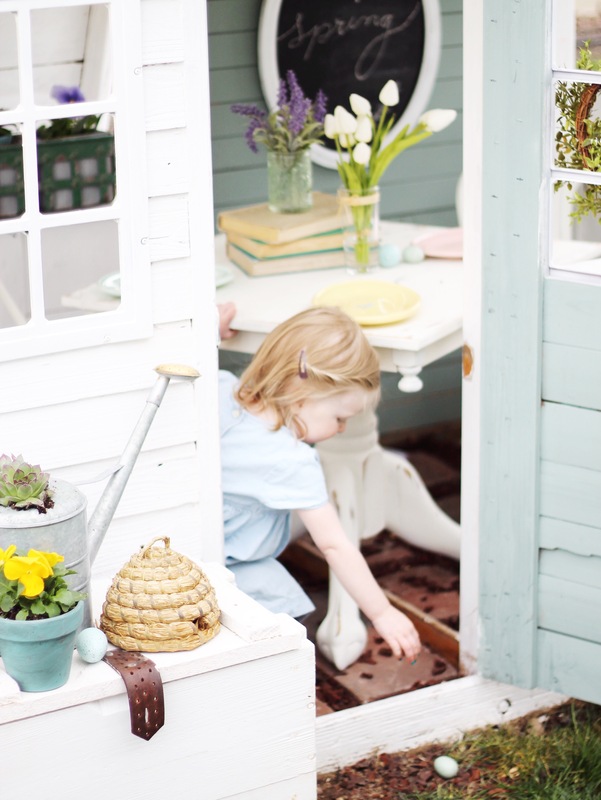 Wow, this has got to be—by far—the most beautiful playhouse transformation I’ve seen! It’s absolutely gorgeous. I’m obsessed. Thank you for sharing. Wondering if you remember the name and brand of the light green paint you used for the door and window trims. Thank you for your kind comment! We don’t have the paint color. We honestly mixed a few colors we had around the house. Sorry! I hope you can find a similar color!